A perfect gift for a new big brother or big sister, this collection of 21 poems celebrates growing up and milestones both large and small in a young person's life, such as learning how to whistle, riding the school bus alone, and becoming an older sibling. Growing up is exciting! It's packed with firsts like losing a tooth of visiting the ocean. It's bursting with accomplishments like figuring out how to snap, and learning to ride a bike. And it's full of changes that change you like being stung by a bee and realizing that even big kids cry, or holding your baby brother for the first time. 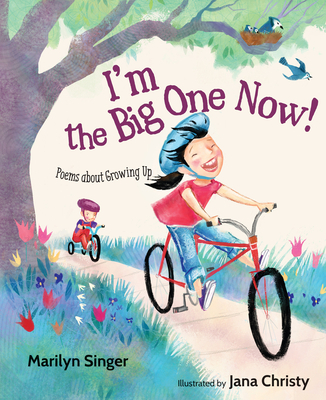 This collection of poems by award-winning author Marilyn Singer salutes significant milestones for every child and is accompanied by sweet, joyful illustrations by Jana Christy.